Their descendants were members of the Beaufort family, which played a major role in the Wars of the Roses. Henry VII, who became King of England in 1485, derived his claim to the throne from his mother, Margaret Beaufort, who was a great-granddaughter of Gaunt and Katherine Swynford. His legal claim to the throne, therefore, was through a cognatic and previously illegitimate line. Henry's first action was to declare himself king "by right of conquest" retroactively from 21 August 1485, the day before his army defeated King Richard III at the Battle of Bosworth. Katherine was the daughter of Paon de Roet, a herald, and later knight, who was "probably christened as Gilles". She had several siblings including Isabel (also called Elizabeth) de Roet, and a brother, Walter. Isabel later became Noble canonesse of Saint Waltrude Collegiate Church, Mons, c. 1366. Philippa Chaucer, wife of the poet Geoffrey Chaucer, is known to have been a sister of Katherine's. It is known that Philippa was in the service of John of Gaunt's second wife Constance of Castile, before John of Gaunt's marriage to Katherine. Katherine is generally held to have been Paon de Roet's youngest child. However, Alison Weir argues that Philippa was the junior and that both were children of a second marriage. She was probably born in Hainaut in 1349 or 1350. Katherine's birth date may have been 25 November, as that is the feast day of her patron, St. Catherine of Alexandria. In about 1366, at St Clement Danes Church, Westminster, Katherine, aged sixteen or seventeen, contracted an advantageous marriage with "Hugh" Ottes Swynford, a knight from the manor of Kettlethorpe in Lincolnshire, the son of Thomas Swynford by his marriage to Nicole Druel. She had the following children by him: Blanche (born 1 May 1367), Thomas (21 September 1368 – 1432), and possibly Margaret Swynford (born about 1369), later recorded as a nun of the prestigious Barking Abbey nominated by command of King Richard II. Katherine became attached to the household of John of Gaunt as governess to his daughters Philippa of Lancaster and Elizabeth of Lancaster. The ailing duchess Blanche had Katherine's daughter Blanche (her namesake) placed within her own daughters' chambers and afforded the same luxuries as her daughters; additionally, John of Gaunt stood as godfather to the child. Some time after Blanche's death in 1368 and the birth of their first son in 1373, Katherine and John of Gaunt entered into a love affair that would produce four children for the couple, born out of wedlock but legitimized upon their parents' eventual marriage; the adulterous relationship endured until 1381 when it was truncated out of political necessity and ruined Katherine's reputation. On 13 January 1396, two years after the death of the Duke's second wife, Infanta Constance of Castile, Katherine and John of Gaunt married in Lincoln Cathedral. Records of their marriage kept in the Tower and elsewhere list: 'John of Ghaunt, Duke of Lancaster, married Katharine daughter of Guyon King of Armes in the time of K. Edward the 3, and Geffrey Chaucer her sister'. On John of Gaunt's death, Katherine became known as dowager Duchess of Lancaster. She outlived him by four years, dying on 10 May 1403, in her early fifties. 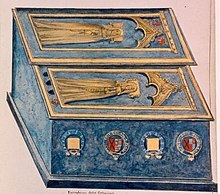 Katherine's tomb and that of her daughter, Joan Beaufort, are under a carved-stone canopy in the sanctuary of Lincoln Cathedral. 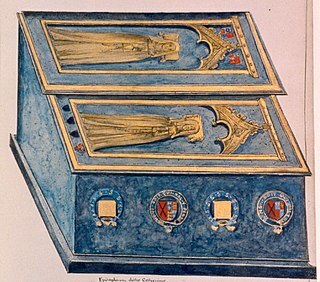 Joan's is the smaller of the two tombs; both were decorated with monumental brasses — full-length representations of them on the tops, and small shields bearing coats of arms around the sides and on the top — but those were damaged or destroyed in 1644 during the English Civil War. A hurried drawing by William Dugdale records their appearance. Sir Thomas Swynford (1367–1432), born in Lincoln while his father Sir Hugh Swynford was away on a campaign with the Duke of Lancaster in Castile fighting for Peter of Castile. The descendants of Katherine Swynford and John of Gaunt are significant in English and Scottish history. Their four children had been given the surname "Beaufort" and with the approval of King Richard II and the Pope were legitimated as adults by their parents' marriage in 1396. Despite this, the Beauforts were barred from inheriting the throne of England by a clause ('excepta dignitate regali') in the legitimation act inserted by their half-brother, Henry IV, although modern scholarship disputes the authority of a monarch to alter an existing parliamentary statute on his own authority, without the further approval of Parliament. 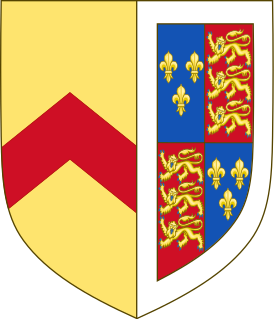 This provision was later revoked by Edward VI, placing Katherine's descendants (including himself) back within the legitimate line of inheritance; the Tudor dynasty was directly descended from John and Katherine's eldest child, John Beaufort, great-grandfather of Henry VII, who based his claim to the throne on his mother's descent from John of Gaunt, a son of Edward III. John Beaufort also had a daughter named Joan Beaufort, who married James I of Scotland and thus was an ancestress of the House of Stuart. John and Katherine's daughter, Joan Beaufort, was grandmother of the English kings Edward IV and Richard III, the latter of whom Henry Tudor (thus becoming by conquest Henry VII) defeated at the Battle of Bosworth Field; Henry's claim was strengthened by marrying Elizabeth of York, eldest daughter of Edward IV. It was also through Joan Beaufort, Countess of Westmoreland that the sixth queen of Henry VIII, Catherine Parr, descended. John of Gaunt's son — Katherine's stepson Henry of Bolingbroke — became Henry IV after deposing Richard II (who was imprisoned and died in Pontefract Castle, where Katherine's son, Thomas Swynford, was constable and is said to have starved Richard to death for his step-brother). John of Gaunt's daughter by his first marriage to Blanche of Lancaster, Philippa of Lancaster, was great-great-grandmother to Catherine of Aragon, first wife of Henry VIII and mother of Mary I of England. John of Gaunt's child by his second wife Constance, Catherine (or Catalina), was great-grandmother of Catherine of Aragon as well. ^ a b c d e f g Weir, Alison (2007). Katherine Swynford: The story of John of Gaunt and his Scandalous Duchess. London: Jonathan Cape. ISBN 0-224-06321-9. Alison Weir, Mistress of the Monarchy: The Life of Katherine Swynford, Duchess of Lancaster (U.S. title). Judy Perry, "Katherine Roet's Swynfords: a re-examination of interfamily relationships and descent", Foundations (Foundation for Medieval Genealogy), Vol. 1, No. 1 & 2 2003–2004. Joan Beaufort, Countess of Westmorland, was the fourth of the four children of John of Gaunt, 1st Duke of Lancaster, and his mistress, later wife, Katherine Swynford. In her widowhood, she was a powerful landowner in the North of England. Margaret Holland was a medieval English noblewoman. She was a daughter of Thomas Holland, 2nd Earl of Kent, who was the son of Joan "the Fair Maid of Kent". Margaret's mother was Alice FitzAlan, daughter of Richard FitzAlan, 10th Earl of Arundel and Eleanor of Lancaster. Katherine is a 1954 historical novel by American author Anya Seton. It tells the story of the historically important, 14th-century love affair in England between the eponymous Katherine Swynford and John of Gaunt, Duke of Lancaster, the third surviving son of King Edward III. Blanche of Lancaster was a member of the English royal House of Plantagenet and the daughter of the kingdom's wealthiest and most powerful peer, Henry of Grosmont, 1st Duke of Lancaster. She was the first wife of John of Gaunt, the mother of King Henry IV, and the grandmother of King Henry V of England. Paon de Roet (c.1310–1380), also called Paon de Roët, Sir Payn Roelt, Payne Roet and sometimes Gilles Roet, was a herald and knight from Hainaut who was involved in the early stages of the Hundred Years War. He became attached to the court of King Edward III of England through the king's marriage to Philippa of Hainaut.